MEND asks for US Mediation: Should the Administration do it? Nigeria is a Major Supplier of Oil to the United States. so During the President's recent Jaunt through Africa the Group MEND sent Him a Letter to Mediate their Dispute with the Nigerian Government. Should the US Do it? First of All Who is MEND? MEND stands for the Movement for the Emancipation of the Niger Delta. For Several Years they have waged an Insurgency against several successive Nigerian Presidents. WHAT IS THEIR MAIN COMPLAINT? 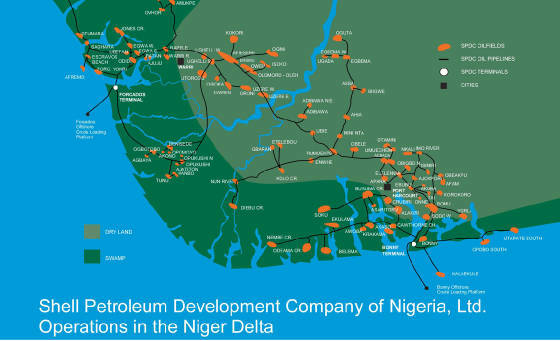 The Niger Delta is the Home of the Petroleum Industry in Nigeria. It is also one of the Poorest States in Nigeria and the location of severe Environmental Damage as well. The Group has used Insurgency and Kidnapping of Foreign Oil Workers to try and force discussions regarding the redress of issues that they have with the Government in Abuja. Above you see some of the Platforms that are being used to Extract Oil in the Niger Delta. In the Eyes of some Counter Terrorism Experts MEND is a Terrorist Organization. And the US Policy of "We don't Negotiate with Terrorists may be used here." Secondly We Need to Know what the Status of the Leader of MEND Henry Okah is. He was Extradited from Angola to Nigeria sometime after the Letter was sent to President Bush. There are rumors that He May have died in Nigerian Custody. MEND Is asking to see if whether or not he is alive or not. Some of the Proposals that MEND made include having Negotiations to determine how Oil Revenue can be distributed in the region from Federal, State and Local Governments and a Disarmament by MEND. Will President Bush act on this Proposal? Only He Knows this Answer. The Confused Eagle will Continue to Monitor the Situation regarding the Status of Mr. Okah and will report when details become available.